Finding similarly pictures and duplicate photos can become an overwhelming project. This is where duplicate photo finders come in. Remember that you should always backup all files before doing any deletion, which is a good practice to take regularly, for example to a DVD or an external hard drive. All software in this article is sorted from best to worst. Anti-Twin can use either byte-to-byte or pixel-to-pixel comparison to check for image similarity. Otherwise, you can activate name comparison, content comparison or both. By default, Anti-Twin marks itself as a low priority process, but this can be changed by going to “Control” and unchecking the option. To select files for deletion in the result list, click the box left to the filename and the symbol will change to a red X. 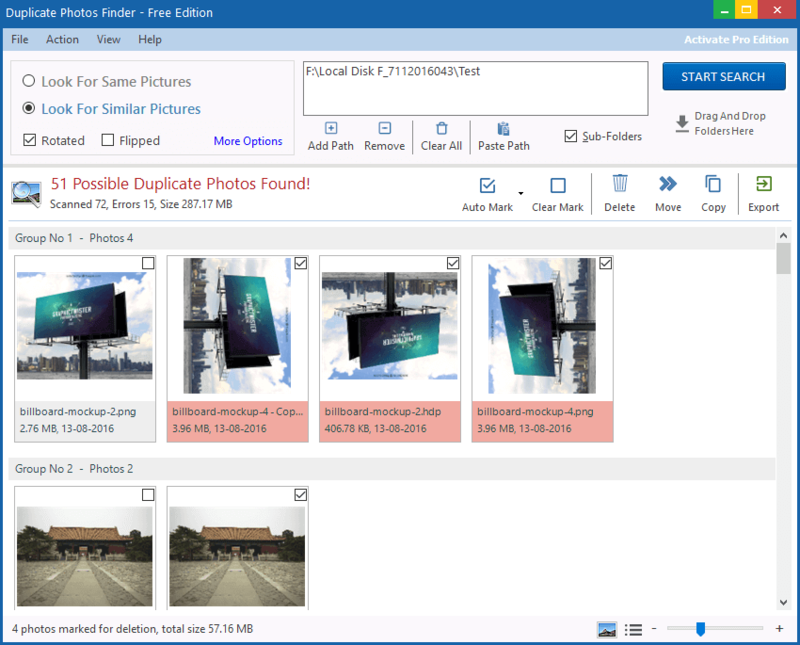 If you get too many pictures on your harddrive, downloaded or photographed, from several different sources, it may happen that you have many duplicates. In that case, you need a quick and easy to use program that finds and deletes all your duplicates. 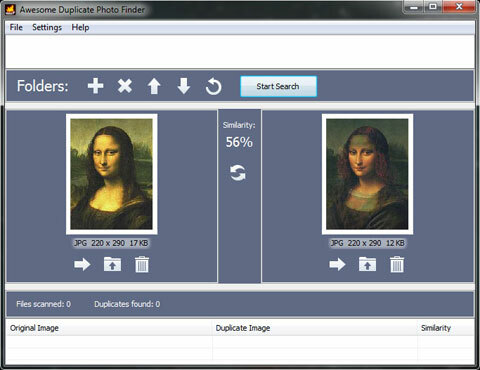 The application allows you to search for duplicate images using three different filters; Strict, Basic and Loose. All detected duplicates are shown side by side with pertinent information such as file name, type, and size being displayed. It's auto-select mode let you choose if you want to keep the higher resolution picture, space-saving file type, smaller file size or all of the above. If you are insecure over what you really want to delete you can manually select the images you don't want to keep and delete them yourself. 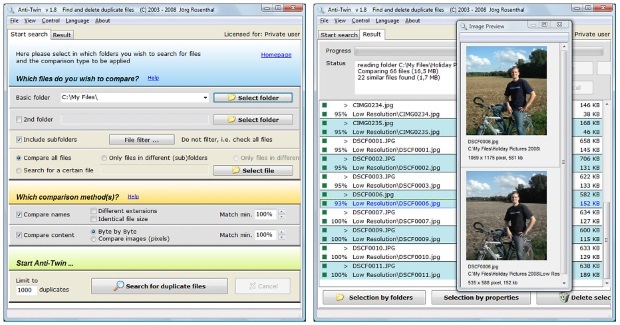 VisiPics also allows you to search using the"Auto-Select" feature which will mark images with smaller, uncompressed, lower resolution copies as duplicate images. 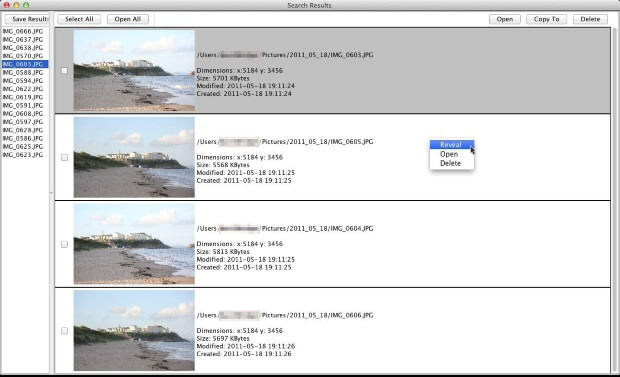 Similar Image Search is a free software that lets you find duplicate images on your PC. It is a standalone JAR file and requires Java installed on your PC to run. 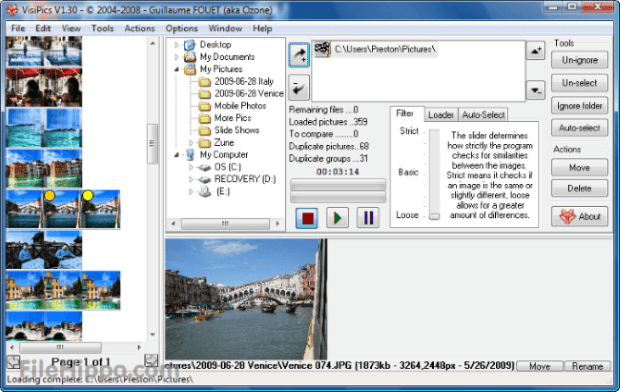 It can search for duplicate image files in any selected folder. First, add the folder then click Library Search and then click Reverse Image Search from the sub menu. It will show you the list of duplicate images in the selected folder and you can easily delete them. It's designed for photographers to sift through a memory card dump, searching for photos in batches for ease of sorting.